Fort Wayne, Indiana has a professional baseball team, the TinCaps. They are a Class A minor league team. Class A is where professional baseball careers begin, and successful players progress to AA, AAA, and then the big leagues. How do I know about the TinCaps? I needed to find out about them because of my job. I work with people and organizations to help them develop better speaking skills. It’s my job to make individuals more confident, competent, and effective oral communicators. One day my job took me to Fort Wayne, Indiana. My topic in Fort Wayne was the same as my topic in Austin, San Francisco, Dover, and every other city. The content I share is the same: the keys to better speaking. So why did I need to find out about a small baseball team? There are other ways to connect yourself to the listeners. Pick up on what someone is wearing and use the information to start a conversation. A shirt with a team logo? From a vacation spot? From a TV show or movie? “Oh no, Patriots fan?! I’m from Denver so I don’t think we’ll get along.” or “Grand Canyon? When did you go there?” Eavesdrop. “I heard you say that your kids had a soccer game yesterday. My son is crazy about soccer.” Reveal something that you have in common with listeners. “I was so nervous when I was in your position. 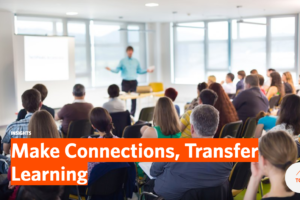 I remember being in a training similar to this one years ago, and I was asked to…” These types of connectors move you from Outsider to One Of Us. Add connectors that connect your topic to the lives of your listeners, too. The framework for developing speaking skills that I share does not change from place to place, yet each talk is different. I add some things to make sure listeners know that what I share applies to their lives. In one place I might say, “You are IT people. Have you ever been in the position of trying to explain something technical to a non-IT person and they just didn’t get it? We can fix that.” I’ll use IT examples throughout my talk. In another place, “You’ve watched an associate talking to a client and thought, ‘Wow, this isn’t working,’ haven’t you? This is how to help them.” My examples will all pertain to management. There is never a generic training or generic talk. Audience members should know that your message directly applies to their lives. These types of connectors move you from Generic Speaker to Person Helping Me Be Better. If you care enough to add connectors, your listeners will care more about what you have to say. Simple additions to your talk will make you much more effective.